Be the first to share your favorite memory, photo or story of Franklyn. This memorial page is dedicated for family, friends and future generations to celebrate the life of their loved one. 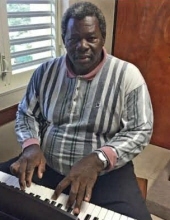 Relatives and friends are advise of the passing of Franklyn A. Maynard also known as “Maynie or Big Man” who passed away on August 24, 2018 at his residence at the age of 64. Cherrisa, Tesahwn, Teshron, Chelsea & Clive Maynard, Mackline, Wallace Hendrickson, Allancia Maynard, K’NQuia &Kaleem Fredricks, Natasha, Winnaye, Kaviah, Kiarah, Michelle, Kavian Clarke ,Michael Clarke Jr, D’Andra Richards, Anesa, Calliyah, Calvin Liburd. Relatives and friends are respectfully invited to attend first viewing on Friday September 7, 2018 at Celestial Chapel of Hurley Funeral Home 7:30pm – 9pm. Second viewing will be held on Saturday September 8, 2018 10am – 11am at The Church of Jesus Christ Latter Day Saints with service immediately following at 11am. To plant a tree in memory of Franklyn A. Maynard, please visit our Tribute Store. "Email Address" would like to share the life celebration of Franklyn A. Maynard. Click on the "link" to go to share a favorite memory or leave a condolence message for the family.